This is the drawing for Design 1D in Measure 32 colors drawn for the USS Massachusetts (BB-59) probably dated November or December 1943, since it was sent to Massachusetts on December 8, 1943. 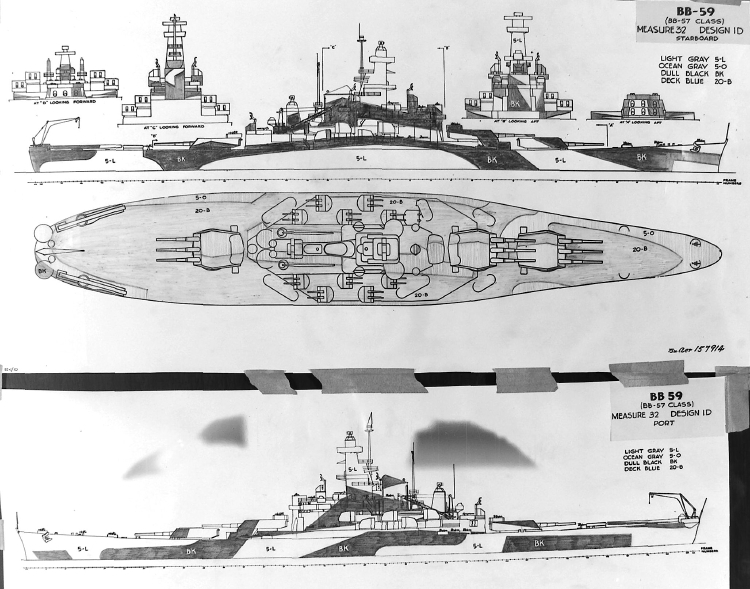 As with the earlier design for Tennessee, the pattern was stretched over a larger ship, but the pattern on the superstructure was much different to break up a different profile. The stretch of the pattern has added a panel to the port bow. This version of Design 1D was apparently never used. The Measure 32 colors are dull black (BK) and light gray (5-L) vertically with ocean gray (5-O), deck blue (20-B) and one panel of black (BK) on the horizontal surfaces. The first drawing for Design 1D was attached to the March 1943 Supplement to SHIPS-2 for DD-380 Gridley class using Measure 33. Design 1D was also worn by the battleship USS Tennessee (BB-43), the large cruiser USS Alaska (CB-1), the light cruisers USS Raleigh (CL-7), USS Houstan (CL-81), and USS Miami (CL-89) all in Measure 32 colors. The light cruiser USS Columbia (CL-56) wore this design using Measure 33 colors. In addition, Design 1D was worn by a few Evarts class destroyer escorts. Original drawing source: NARA 80-G-157914.